This unique campsite has been built to incorporate the natural landscape, which is one of the most beautiful in Brittany. Here, both land and ocean are filled with pink granite rocks that have been moulded by many centuries of wind and waves, causing it to be declared a protected area. 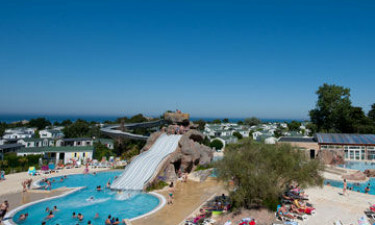 The luxury camping site lies at the heart of what has become known as the Pink Granite Coast, which makes this a camping holiday with a difference. Let LUX-camp secure your mobile home at this stunning holiday camping site for the chance to have a close encounter with nature’s beauty and perfection. Accommodation that is spacious and fitted with every modern amenity. An aquatic centre that inspires holiday pool-time fun. A spectacular and unspoilt coastline that promises seclusion. On-site sporting and fitness facilities for the energetic and health conscious. 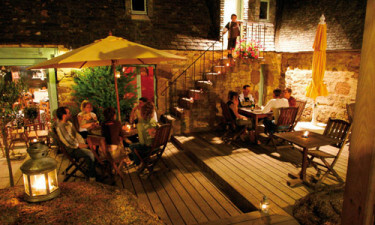 Guests at the luxury camping site of Ranolien can be forgiven for thinking of it as more of a village than a campsite. Bars, restaurants and a well-stocked supermarket take care of appetites, while luxury camping here extends to having a well-equipped gym and aqua-gym housed in a fabulous spa centre. There is also a mini cinema, a newsagent, a library and a photographic studio - all intended to provide camping luxury that will always be remembered. Renting a mobile home, luxury tent or bungalow tent via LUX-camp will locate guests in 15 hectares of woodland that has direct access to the clear blue waters of the Mediterranean. For those who love exploring on foot, life outside Le Ranolien luxury camping site is easily accessed by footpaths that allow for close-up studies of the unusual pink granite rock formations, for which the region is famous. 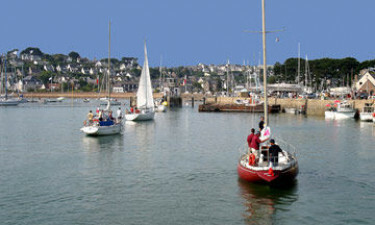 Travelling a little further afield to Perros-Guirec allows visitors to explore a quaint old fishing harbour, as well as 13 kilometres of magnificent coastline. Boat trips are also available to the archipelago of Les 7 Iles to marvel at the huge array of marine birds that make this their home. Two of Brittany’s finest soft, golden beaches are located close to Le Ranolien Campsite, offering lazy days - or more energetic activities such as scuba diving. However, one does not have to leave the campsite to find complete relaxation or tons of fun. A kiddies club takes care of junior’s holiday entertainment, while bars provide some nighttime entertainment for adults. The Chez Prosper on-site restaurant allows fine indoor and outdoor dining on a wide variety of tasty dishes. Traditional sweet and savoury crepes are also available, while a snack bar offers sandwiches, salads, French fries and other favourites. An amply stocked on-site supermarket provides well for the larder, the sweet tooth, the news-hungry and souvenir hunters.